The Firehouse Theatre Project, Inc.
February 7, 2008, 6 p.m. This exhibition features artists with disabilities who are at the forefront of using new media to convey personal experience. The exhibition will be presented in association with arts>World Financial Center. Calling all creative people with learning disabilities. In honor of our 31st anniversary, the National Center for Learning Disabilities (NCLD) is looking for self-portraits that capture what life is like for individuals with learning disabilities (LD). What story does your portrait tell? Share with us expressions of your hopes, dreams, struggles and successes. Show us what the world is like through your eyes. Help us to celebrate the unique vision of children and adults affected by LD. To enter, please send NCLD your submission(s), a photo of the artist, a short paragraph (three to five sentences) written by the artist detailing their experience with LD, and completed release forms. Grand prize winners must provide relevant documentation of a specific learning disability. If you have any questions, please email Teneille Craig. All entries must be received no later than Friday, February 8, 2008. Click here to download rules and requirements of the competition. 12 12 Gallery is pleased to announce an open call to artists and photographers for its second annual Manchester National Juried Fine Art Exhibition. Artists age 18+, working in 2D and 3D any medium, in the United States and Canada may submit up to 10 slides or digital files of work to be considered for the exhibition. The exhibition will be curated by N. Elizabeth Schlatter, Deputy Director and Curator of Exhibitions, University of Richmond Museums, and will award over $1000 in cash prizes. N. Elizabeth Schlatter, has curated more than 20 exhibitions, including the recent exhibition “Leaded”, and of work by Andreas Feininger, Hans Friedrich Grohs, and Fiona Ross. As an independent curator and writer, Ms. Schlatter has organized exhibitions for contemporary art spaces in the mid-Atlantic region, and has authored several articles and essays for Focus and Photovision magazines, the National Women in the Arts Bulletin, and the American National Biography (Oxford University Press), among others. She is also author of the on-line publication “Become An Art Curator.” Prior to working at the University of Richmond she was an exhibitions project director for the Smithsonian Institution Traveling Exhibition Service (SITES) in Washington, D.C.
You can submit your work online, download the Prospectus and a printable entry form or get more information about submitting work for this exhibition by visiting the Call for Entries page on the 12 12 Gallery website. Multiple Sclerosis Association of America requests submissions of artwork from visual artists who have Multiple Sclerosis. MSAA will provide reproductions of the winning art as a benefit for significant supporters. To enter the contest, you must have a diagnosis of multiple sclerosis. We will accept artwork in the following media: painting (oil or watercolor), or graphic arts. We honor all people who share their art and we thank you for taking the time to share your creativity with us. For more information and sumission rules please visit the MSAA website. The Greeks had nine guiding geniuses of creative inspiration, the Nine Muses. Ancient Grecians knew how to please and solicit their help. So should we, as Creative Spirits. Inspiration is often fickle, unpredictable and unaccountable. What can we do to make sure that our free spirited Muses feel welcome and at home with us? Of course, there is no one answer but there is a common denominator: what your muse wants from you is your time. Many of us are familiar with the terrific idea that hits you in the middle of a business meeting or as you grab your keys and head out the door. But usually, the idea is lost by the time we are home and in front of the keyboard, at the easel, or behind the pen. Muse-pleasing works on the same principle as dreamwork. Your Muse likes to be invited, just like dreams. Natalie Goldberg suggests, “showing up for work”- even if you sit there blankly for an hour and nothing happens, fingers disturbingly still. Set aside regular time to wait, to pay attention, to listen, to be there. However, muses are allergic to imperatives and don’t appear to place such a high price on producing as we do. They like us to give ourselves time to play and daydream, to think and ruminate, to muse and be amused. What does your Muse look like? What kind of Muse do you have or do you want? What is her name? What does your Muse prefer? Does she prefer blues to classical; roses or daffodils? Does she have a favorite color or fragrance? Is she your sister, a mentor; a spirit or an intimate friend? When we symbolize creative inspiration this way, we are more likely to set up the best atmosphere for keeping our Muses and our creative selves by extension, content and well fed. Inspiration needs nourishment and no one wants to starve his or her Muse. Museums, libraries, galleries, concerts, nature and bookstores keep your Muse interested and inspired– and your creativity in almost constant bloom. Like people, Muses enjoy friends. Maybe you have developed relationships that scoff at your attempts and ignore your achievements but no self-respecting Muse stands for this. If you keep your Muse in mind, she will help you to choose friendships that will support and nurture your creativity. Muses hate to be bored and many aspects of our culture do this- television, mall music and the erroneous idea that we exist to shop and buy in our pervasive advertising. When my Muse starts to snooze, I take it as an indication that I need to choose more things that keep Her awake and alert. It’s difficult to engage your Muse when you are surrounded with noise and chaos. Vital to a muse is a private place. A converted garage, or attic or the corner of a room for your chosen form of art makes that private place for you and your Muse to form a deep and lasting kinship. Lastly, some sort of regular, spiritual practice seems to please the Muse. Whether this includes meditation, a certain type of music, singing, drumming, prayer, burning candles, lighting incense or something completely different; it doesn’t matter. What matters is that if you feel dried out or burned up, spending some focused time on what inspires you and fills your dreams can bring you to the well and allows you to drink the water of creativity. Muses get thirsty too. 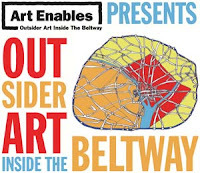 If you are a self-taught and/or outsider artist looking to show and sell your work, Art Enables needs to see it by September 7, 2007 to be considered for Outsider Art Inside the Beltway 2007! Outsider Art Inside the Beltway is an intriguing look at differences in common celebrating the unique voices of dozens of area outsider and self-taught artists. Outsider Art Inside the Beltway is a juried show of the best of outsider and folk art produced in and around DC in programs that give artists the chance to tell their stories through visual art. Individual self-taught artists will also be featured. The exhibition will be at the Art Enables Gallery October 13, 2007 from 11 AM to 7 PM, with an opening talk beginning at 5 PM. To submit work and get more details or information, contact Art Enables at 202.554.9455 or e-mail info@art-enables.org. You can also download the flier here or e-mail the Outside the Lines Program Director at outsidethelinesart@gmail.com for further information. No entry fee. There is no question that artists with disabilities experience a world quite different from the world that is experienced by those without disabilities. As a result, their artistic strength is generously unfiltered and their art is infused with a directness and enthusiasm that often leaves the viewer filled with a sort of emotional awe. The artists who work with Art Enables are no different. Many of these artists are, for whatever reason, isolated from mainstream ideas of what “art should look like”. At the Art Enables studio they find an environment where they are free to not only move and listen to their inner muses but also free to explore new techniques and work with quality materials while seeing their work marketed to a broad public that earns them money. Outside the Lines is proud to be able to exhibit the art of the artists of Art Enables. The work exhibited here shows not only a wide spectrum of color but also a broad spectrum of emotion, grit and whimsy. Each piece is unique, intriguing and idiosyncratic all at once. Every artist featured here gives us an often humorous and unfiltered look at their inner worlds. If every picture tells a story, it is my hope that you will enjoy the stories told here as much as we do. The National Coalition of Mental Health Consumer/Survivor Organizations is having a Logo contest. We need a logo for T shirts to sell at Alternatives as well as have it for the presidential forum. The Coalition will offer $100 to the winner plus give credit to the artist. Themes to consider: Rights, Recovery, Hope, Voice. A powerful, uplifting image would be great. Artists of all ages and levels of experience invited to display their art and compete for prize money! The National Arts Program(r) at Richmond, coordinated by Richmond Parks, Recreation and Community Facilities, invites artists of all ages and levels of experience to participate in exhibitions and compete for a total of $2,440 in prize money. There are no fees and all art submitted according to the rules of exhibit will be displayed. Youth ages 5-17 are invited to compete in the Youth and Teen Showcase, to be held at Science Museum of Virginia.Adult artists compete in Creative Reflections, to be held at Pine Camp Arts and Community Center. Now in its ninth year in Richmond, The National Arts Program(r) is one of the most innovative grass roots arts projects in the country and has achieved widespread recognition for successfully nurturing creativity and fostering self-confidence among artists. Registration brochures providing details on how to enter are available on line here. They are also available at Pine Camp Arts and Community Center, or by calling 646-3674. The deadline for registration is June 13, and the art shows will be held July 2-20.The National Arts Program is sponsored by the National Arts Program Foundation of Malvern PA; Richmond Parks, Recreation and Community Facility’s art program, and Science Museum of Virginia. For more information, call 804-646-3674. The 18th annual Insights Art Exhibition of work by blind and visually impaired artists is calling for submissions. Work by legally blind artists in all mediums except video will be considered. The show will run in October 2007 at the San Francisco Arts Commission Gallery at City Hall. Cash prizes will be awarded. Friday, June 15, 2007. To receive an application by mail, contact Terri Leong, Exhibition Coordinator, at insights@lighthouse-sf.org or 415.431.1481 ext. 335 or visit the presenter’s (San Francisco LightHouse) website to download an application at http://www.lighthouse-sf.org.